Natural rubber is used in various everyday products such as rubber bands, wellies, and car tyres. Despite its name, a sustainable and ‘natural’ rubber manufacture is not a given. More often than not, rubber is manufactured without any regards for nature, wildlife, or the manufacturers themselves. The inconsiderate manufacturing procedures lead to poor working conditions and carry negative consequences on the environment – and thus the orangutan’s livelihood. But rubber manufacture can be made sustainable and responsible and become part of the solution to save the critically endangered orangutan and ensure better living conditions for the local communities. In September of 2018, Save the Orangutan and our partner BOSF-Mawas started up a pilot project in Mawas, aiming to make the Bornean rubber manufacture sustainable and responsible. A sustainable rubber manufacture can become part of the solution to conserve Borneo’s unique biodiversity, protect the critically endangered orangutan, and it can benefit the local communities involved in the manufacture. 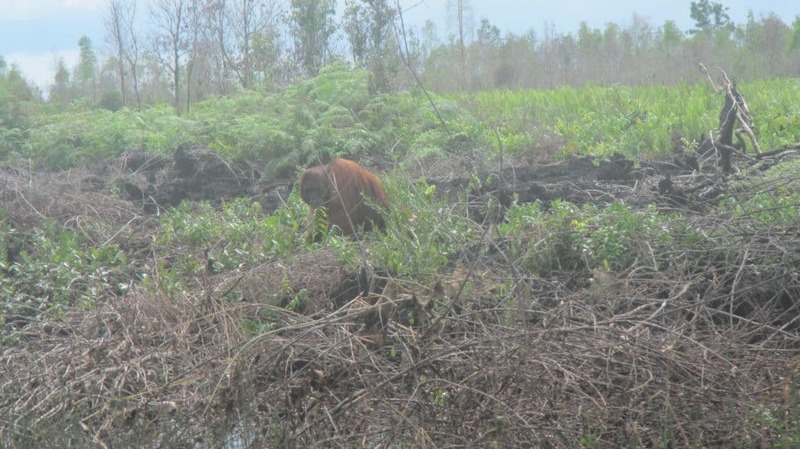 In its initial phase, the project’s focus is on a village in the Mawas area in Central Kalimantan on Borneo, home to one of the largest wild orangutan populations in the world. The project will convert the rubber manufacture to an agroforestry system, and the goal is to test out several possibilities to create best practices for other villages and smallholders across Borneo to follow. With a combination of plant species with different agricultural cycles cultivated in the same area, sustainable rubber manufacture in an agroforestry system enhances the biodiversity and provides current income for the manufacturers. Moreover, because the combination of plant species enhances water absorption, the cultivated area’s resistance to threats such as forest fires increases. Sustainably manufactured areas can therefore function as buffer zones around orangutan habitats, and it can reduce the pressure on an area’s natural resources and its wild orangutan population. Save the Orangutan and BOSF-Mawas started up a project in the village of Timpah in September of 2018. The project aims to make the rubber manufacture sustainable and responsible through a conversion to an agroforestry system. 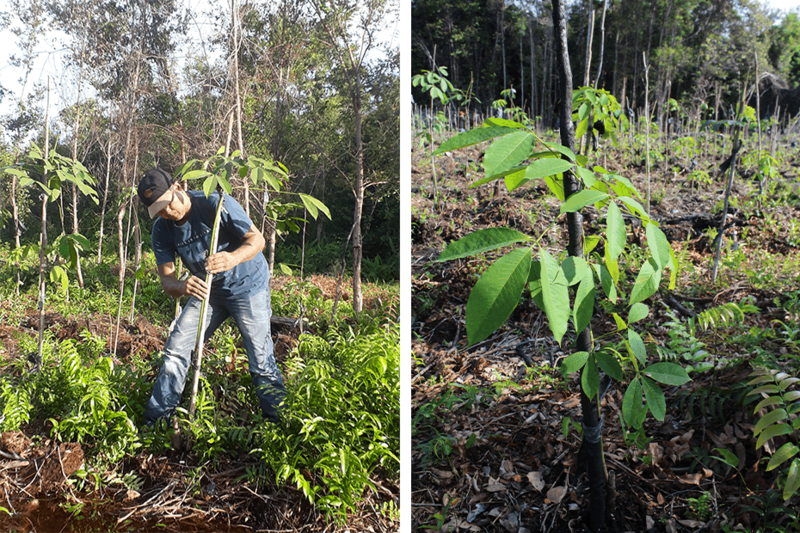 The images show some of the results from the project’s initial phase: a local seed nursery has been established to produce high quality rubber trees. 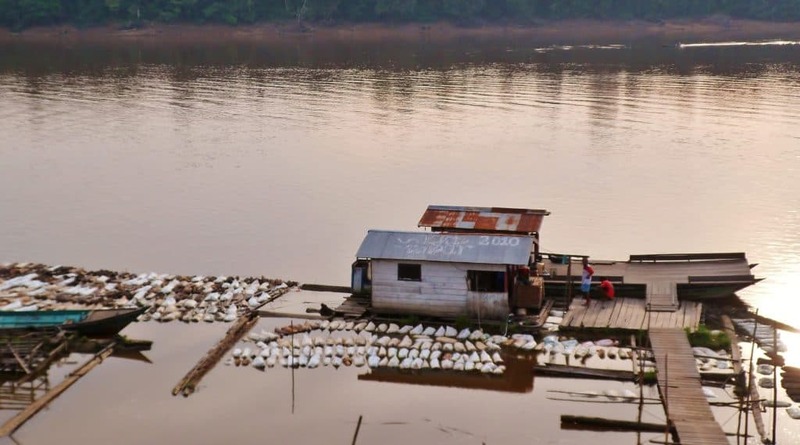 The nursery is the first of its kind in all of Central Kalimantan. Indonesia is the world’s second largest rubber manufacturer and rubber trees cover 3.5 million hectares of land. Locally in Timpah, the village in the Mawas area where Save the Orangutan’s project is initiated, 80% of the approximately 3000 inhabitants are involved in some form of rubber manufacture. But the Indonesian rubber manufacture is characterised by poor working conditions, low income, and the quality of the natural rubber is much poorer than the quality of rubber from comparable areas. The low-quality natural rubber from Timpah can be explained by smallholders’ lack of knowledge on efficient manufacture. Additionally, the manufacture often fails to take nature and wildlife into account. Although the rubber manufacture traditionally was characterised as ‘jungle rubber’ with rubber trees being part of a forest area, monocultural plantations have become the norm. With a monocultural norm comes deforestation, which destroys precious orangutan habitat and threatens the biodiversity. Monocultural manufacture implies that only one crop is cultivated in an area. The biodiversity is therefore not restored after initial forest clearing, and the soil dries out and becomes flammable due to the lack of different root lengths and a full canopy. Consequently, the risk of forest fires increases. In between the harvests, harmful chemicals are applied in pest and disease control, harming both nature, wildlife, and the manufacturers themselves. The primary reason for the poor working conditions, the low quality of rubber, and the lack of regard for wildlife and manufacturers is a lack of knowledge. The manufacturers lack knowledge on efficient alternatives to monocultural cultivation and chemical pest and disease control, and they do not graft the plants, which would improve the quality of the rubber trees. Moreover, they are unaware of the selling price on natural rubber throughout Indonesia, which makes it easy for buyers to underpay them. The natural rubber from Timpah is of much poorer quality than that from other comparable areas. Low quality and lacking knowledge on pricing results in an extremely low income for the manufacturers. This image shows an attempt to increase the selling price of the natural rubber from Timpah by increasing the product’s weight with water – which only lowers the quality of the rubber further. The natural rubber from Timpah is often bought by middlemen taking advantage of the manufacturers’ lack of knowledge on pricing. This leaves the manufacturers with an average monthly income of only DKK 420 according to Indonesian Rubber Research Institute – which is far lower than the average income in Indonesia. Similarly, the last part of the supply chain is characterised by few regards to the product’s origin, manufacture, and its consequences on wildlife, environment, and the manufacturers. In 2013, Danwatch performed an inspection of 31 Danish distributors of natural rubber. The inspection revealed that only one out of the 31 companies had implemented control of the product’s sustainability. The orangutan’s habitat is destroyed and the orangutan is forced out of its natural surroundings when the rainforests are cleared for the benefit of monocultural plantations such as natural rubber. As part of our agroforestry rubber manufacture project, we will explore the possibilities of obtaining FSC® certification. Sustainable certification ensures a sustainable and responsible manufacture while the manufacturers can sell their products at a higher price. Moreover, certification makes it easier for the consumers to prioritise sustainability. But certification remains a resource- and cost-intensive task, and it requires a market demanding sustainable rubber products with consumers willing to pay the additional charge related to sustainable manufacture. The current climate debate puts sustainability on the agenda and the demand for and prioritising of sustainably and responsibly manufactured natural rubber is increasing. Save the Orangutan hopes this increasing demand can be felt in the Bornean forest villages, and that it will incentivize to ensure a sustainable and orangutan-safe rubber manufacture – which will improve the smallholders’ living conditions as well. You as a consumer can help ensure sustainable and responsible manufacture and thus help protect the orangutan and its habitat by prioritising products certified sustainable – for instance by prioritising products carrying the FSC certification. You as a consumer can help protect the wildlife and biodiversity, including the orangutan and its habitats, by being aware of products’ origins and by prioritising products certified sustainable, for instance products carrying the FSC certification.